There’s a moment in the terribly sad yet life-affirming movie Still Alice when the husband of a woman with early onset Alzheimer’s says to his daughter, “You’re a better man than I”. Alex Baldwin’s character is ironically quoting Mr Kipling, as he admires his daughter’s ability to cope with Alice, her mind unravelling. It is also the way, that when parents are faced with age-related illness and adversity, not all spouses or children are prepared to take up the challenge of becoming a carer. While I even now feel sadness and loss from losing my mother to cancer when I was 17 and she just 48, it is also true that I have escaped the difficult life changes that come with caring for ageing parents. The same goes for She Who Fell Down the Stairs But Got Away With It, who lost her mother at age eight. Both of our fathers have been gone 20+ years, so while there are empty seats at the Christmas table, we can just lock the door and drive around Australia for three months with a clear conscience. I just had a visit from my cousin, who lives in the south of England, just up the road from where my Mum’s surviving sister lives. Auntie is 95 this year and still living independently. Just how long she can keep doing this is the question nobody really wants to ask, or what will happen if and when Auntie has to move into a nursing home. As many adult children faced with this dilemma know too well, parents don’t usually cope well at all with being moved into a 24/7 care situation. A friend put me up to this particular topic (which had crossed my mind already, as you might guess). He and his wife have just moved her Dad in with them; at 89 he’s struggling with an illness and finding it too hard to manage on his own. And I can just hear Mr Shiraz turning away from his laptop and telling Mrs Shiraz: “He’s writing about the sandwich generation this week.” The Shirazes have done this twice, for each other’s mothers, now both gone to their graves. Mr S kept his friends in the loop on Facebook with photos of the daily baking adventures (therapists encourage this kind of activity for people with Alzheimer’s disease). Caring for an elderly parent with Dementia and maybe underlying physical illnesses as well does take its toll on carers. Brothers and sisters weigh in with financial support and respite visits, but it is often down to one adult child and/or spouse. On the other side of the city or in another city altogether, there may be a sibling who does not want to know. If they are well-off, they might ease their own burden of guilt by paying for live-in help. Or not. My white-haired Scottish Auntie now living in the south of England has survived a fall and a broken hip but is still coping home alone. She’d be one of the lucky ones – good genes and family support. She enjoys keeping up with sport on the tele, but needs a walker to get about and deafness makes it hard to communicate her needs. The thing about volunteering to look after an aged parent in your own home is that no-one knows how long this arrangement may last. Five years is a common enough stretch but 15 to 20 years is not unrealistic. Meanwhile, the carers’ social lives are curtailed; their ingrained living habits fall away in favour of someone else’s needs. There are ways of dealing with people who have started having short term memory loss or are sliding ever deeper into Dementia or Alzheimer’s disease. * Adult children quickly learn these tricks as a matter of survival. What usually ends the familial live-in arrangement is a fall that requires hospitalisation, or when it gets to a stage where the carer can’t take any more sleepless nights. I’m sure Mr Shiraz is not the first carer to be woken by a noise at 4am and on investigation finds Mother, more or less fully dressed, standing at the gate with a packed suitcase. “Mike says we have to be at the airport,” she says, though Mike has been gone 12 years. The last time they went to the airport at 4am was when the kids were small and the family was going to Disneyland. I’m changing names and circumstances, but those of you who care for or have cared for parents with Alzheimer’s disease or Dementia will recognise this story. It is sad when someone who has managed to live into their 90s becomes frail and unable to cope, even if their mind is still relatively sharp. A mobility-related fall will accelerate the process; not just the fall, but the fear of having another one. 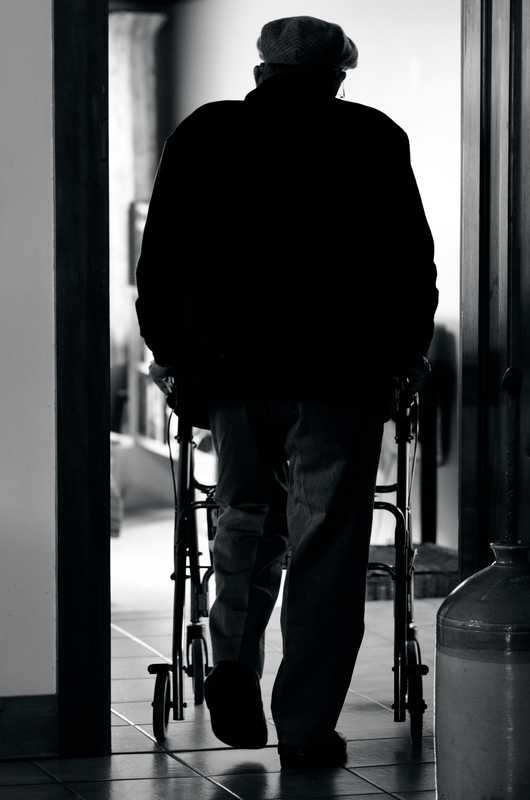 According to Australian Ageing Agenda, one in three people aged over 65 years fall each year. AAA, the media partner of the Australian Association of Gerontology, adds that fewer than 10% of falls cause a serious injury requiring emergency department or hospital admission. All the same, that’s an awful lot of accidents waiting to happen. In 2010-2011, 92,150 people aged over 65 were hospitalised in one year for fall-related injuries. They were in hospital on average for seven days. Head injuries and hip fractures were the most likely result of falls where someone required hospitalisation. About half of these falls were at or around the home, and about 25% happened in residential care facilities. AAA says many of the people who fell did not regain previous levels of mobility and independence. Ironic, isn’t it, that he looked after you when you were a wriggling bundle wrapped in a smelly nappy; soothed you on his shoulder at 3am when you were teething; turned you on your side so the silly drunk teenager you were didn’t choke on your own vomit. *The National Institute on Aging (NIA) defines Dementia as a brain disorder that affects communication and performance of daily activities. Alzheimer’s disease is a form of dementia that specifically affects parts of the brain that control thought, memory and language.